When deciding to spend some time in Hawley, PA, there is a thought that often comes to mind, “What else is there to do?”. Sometimes it is fun to spend a day in another town not too far away and have a different adventure. About 20 miles away, just across the Pennsylvania/New York border is a delightful hamlet called Narrowsburg, NY.Don’t let the size fool you though, Narrowsburg is bursting with fun things to do as well as amazing places to eat. 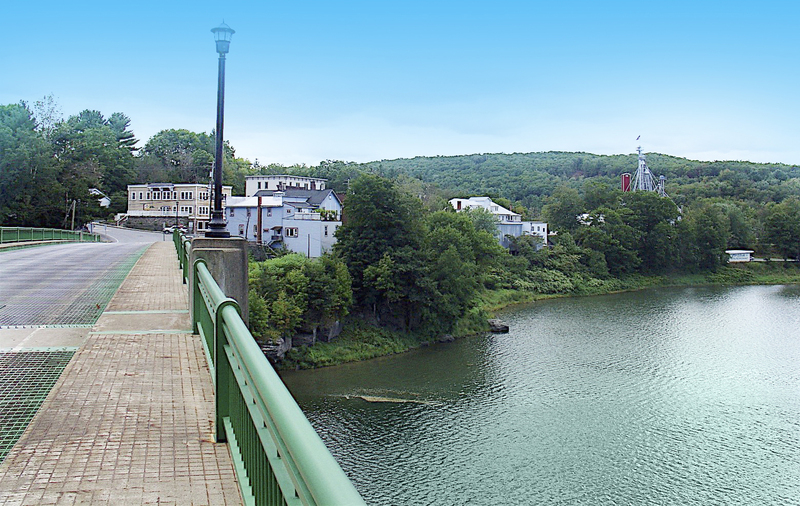 We at Ledges Hotel have come up with some highlights from this hamlet which will make it easy to see why Narrowsburg, NY is a perfect day trip. During this time of year, the best way to enjoy your day is to spend it outside. Fortunately there are a ton of ways to do this. The most popular trail is the Tusten Trail. Located off of Route 97 between Barryville and Narrowsburg, this is a moderately strenuous 3 mile roundtrip trail. You should allow yourself anywhere from 2 to 3 hours to complete the trip and the trail is open from 8:30 am to 6 pm. While on your hike you will experience a difference of 590 vertical feet along with the best of New York’s flora and fauna. Coupled with that, make sure you check out some history in the form of old building foundations. In the 1800’s there was a sawmill, tannery and gristmill that kept the town thriving. Another way to enjoy the outdoors is to hop in the water and enjoy Skinners Falls. Not exactly a waterfall but a popular spot on the Delaware River. Nearby is the Skinners Falls bridge as well as some natural rock formations that make an ideal place for sunbathing and relaxing by the river. You can rent an tube from Landers River Trips and float the 1/4 mile section along the Skinners Falls location, get out and hike back up and do it again all day. When visiting this area, make sure you are aware of your trash and help keep the river beautiful. After spending all day outdoors, the one thing that is on our minds is food. There are plenty of places in Narrowsburg, NY that would love to fill your belly with their delectable dishes. The first restaurant that has to be mentioned is The Heron. Located on Main Street, The Heron is open for brunch and dinner and their menu is definitely American fueled by local food. They have everything on it that would send anyone into a food coma. Make sure you check out their menu to see all that their menu has to offer. Another restaurant is Gerard’s River Grill. Also open for brunch and dinner, this Italian menu has taken all of the best dishes of Italy and brought them to your doorstep. Using local as well as organic ingredients which will not only keep your body healthy but the local businesses as well. When planning these day trips, make sure you keep your home base at Ledges Hotel. Situated perfectly between small hamlets like Narrowsburg, NY and in the Pocono Mountains, this boutique hotel is fully equipped to accommodate you in any way. If you aren’t too sure where to go, contact them to get a copy of their vacation guide which will inform you of all of the popular attractions all around Pennsylvania as well as Ledges Hotel exclusives.